GamerPunk | How does the original Borderlands hold up today? Oh dear loot shooters, how you’ve grown. We’ve had two Destiny games, two Divisions from Tom Clancy, Warframe is still going strong and even BioWare’s had a nibble with the divisive Anthem. Nowadays this is a sub-genre with well-defined rituals, core loops, challenges and, of course, highly involved loot systems. The loot shooter is such a known quantity, in fact, that it’s easy to forget how much it owes to Borderlands. 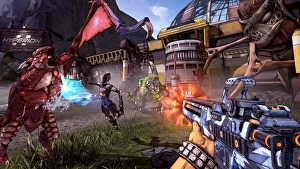 The first instalment of the rambunctious franchise burst onto… Read original at Eurogamer — https://www.eurogamer.net/articles/2019-04-05-how-does-the-original-borderlands-hold-up-today URL of source article. « Halloween 5 Ending Explained: Who Is The Man In Black?